The Perth Mint of Australia treads into new territory with the release of its 2013 Australian Koala 5 oz. High Relief Silver Proof Coin. Never before has the Perth Mint released a five ounce koala coin in high relief. Its unique size, limited mintage of 5,000 and collector’s perennial interest in the koala series combine for an attractive offering that could result in a sellout. Both the obverse and reverse of the silver proof coin are minted on concave surfaces. This ensures an optimum flow of metal when struck by the die, resulting in a superb level of detail in each design. Shown on the high relief reverse is the Perth Mint’s annual design for 2013 Koala silver coins. It was completed by Perth Mint artist Tom Vaughan and showcases an adult koala resting in the fork of a eucalyptus tree. Reverse inscriptions include AUSTRALIAN KOALA and 2013 5 OZ 999 SILVER. The Perth Mint’s ‘P’ mint mark is also on the reverse. Offered on the obverse is a portrait of Queen Elizabeth II by Ian Rank-Broadley. Obverse inscriptions include ELIZABETH II, AUSTRALIA and 8 DOLLARS. The artist’s initials of IRB are below the effigy. Each proof coin is struck from five ounces of 99.9% pure silver. Maximum thickness of the high relief piece is 12.50 mm with a maximum diameter of 50.60 mm. The minimum gross weight of the release is 155.673 grams. 2013 Australian Koala Silver Proof Coins are housed in a presentation case that ships inside an illustrated shipper. A numbered certificate of authenticity is also included. Direct orders are limited to Australia. Pricing for the 5 oz. silver proof coin is AUS $510.00, though that can change based on the market value of precious metals. Today, the Perth Mint is the official issuer of the Australian Federal Government’s Gold and Silver Bullion Coin Program. In addition, it produces some of the world’s most unusual collectible coins. Yeah! In a pig’s eye! $500? Seriously? And not available in the US anyways? Come on….. 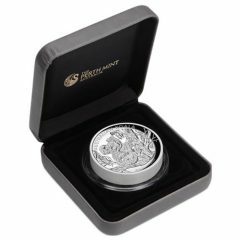 I do believe the Aussies believe, after selling some dumb 1oz silver coin depicting some Chinese superstition for more than $125.00, they figure they can sell this for $500.00. Like I said, when pigs fly, I’ll think about buying on. Seems like the mints and the price of silver are going in opposite directions. The price of silver going down – the price of bullion going up. $60+ over bullion cost is not a collectible for me. FirstFederalCoin says that 300 are staying in Australia and that they have the other 4700 graded with approx. 45% of the 4700 grading PF70. Asked for confirmation from Perth….PF69 for $799? and PF70 for $1129? Reading your discussion, I am wondering was I over charged…? I purchased the 2013P Australia $8 Koala – High Release PF 70 Ultra Cameo One of the First 1000 struck. Although, it was graded by the NGC, placed in an expensive looking case, I am now wondering have I been taken. I will apprciate any comments or suggestion you have in while the difference in cost…I do have a Representative who supposed to let me know the latest and best rear coins buy. First, thank you very much for an educational response. I do value, and will get back to purchasing smaller coins from some of the reputable site you noted. Although, I will be putting away the 5 oz Koala coin for the future for my grandchild… I not materially wealthy, but have wealth in spirit. I don’t have the money to purchase high dollar coins, but his one was for my grandchild. I am amongst the government workers that are furlough until September… Not complaining, but it does require an adjustment in my spending habits. I am blessed, no matter what is happening in the world. Again, thank you very much for taking the time to provide a detailed response. P.S. You got the mint name correct! I got one of these as a gift . The Case says , 2013P Australia S$8 Koala – High Relief PF 70 Ultra cameo . One of first 1000 Struck . The coin # is 0181. Can any one tell me what its worth ? Would it make a difference if the CoA you have says #0001? Thank you Douglas , The person that gave the coin to my fiancée and I was a kind and generous man. The coin will stay with us for a long time. And the many others he has gifted us before his passing . I just couldn’t find much info on this on this particular coin. I thank you again for your help . Also because of this man I started my interest in coins .